The fig and pollinator wasp obligate mutualism is diverse (~750 described species), ecologically important, and ancient (~80-90 Ma), providing model systems for generating and testing many questions in evolution and ecology. 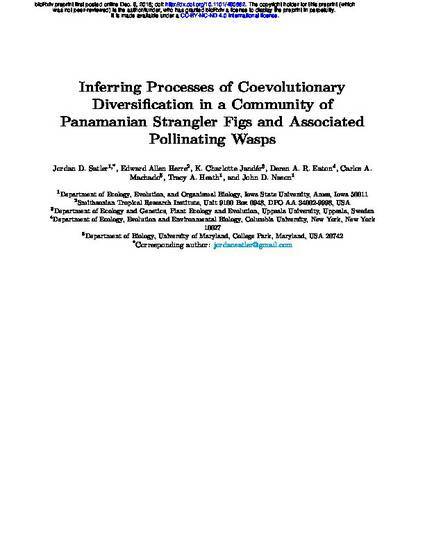 Once thought to be a prime example of strict one-to-one cospeciation, current thinking suggests that genera of pollinator wasps coevolve with corresponding subsections of figs, but the degree to which cospeciation or other processes contributes to the association at finer scales is unclear. Here we use genome-wide sequence data from a community of Panamanian strangler figs (Ficus subgenus Urostigma, section Americana) and associated fig wasp pollinators (Pegoscapus spp.) to infer the process of coevolutionary diversification in this obligate mutualism. Using a model-based approach adapted from the study of gene family evolution, our results indicate pervasive and ongoing host switching of pollinator wasps at this fine phylogenetic and regional scale. Although the model estimates a modest amount of cospeciation, simulations reveal this signal to be consistent with levels of co-association expected under a model of free host switching. Our findings provide an outline for testing how ecological and evolutionary processes can be modeled to evaluate the history of association of interacting lineages in a phylogenetic framework. This is a preprint made available through bioRxiv at doi: 10.1101/490862.